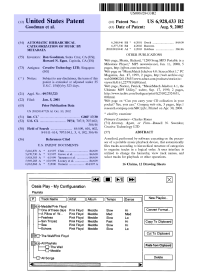 This page deals with an example patent, 6,928,433 [PDF]. The left column (indicated by the blue section on the thumbnail) is shown. Hover your mouse over various items to see explanations of their meaning and significance. Check your understanding by finding the answers to the below questions (click questions to see answers). Ron Goodman and Howard N. Egan. Who owns the rights to the patent? The owner of the patent rights is called the Assignee: Creative Technology LTD. This is often a corporation, can be more than one person or corporation, and may or may not represent the inventors, depending on any agreements made when drafting the patent. When was the patent applied for? This is the filing date, shown under the heading Filed: Jan 5, 2001. This date determines priority if two parties apply for a patent on the same idea; that is, unless the parties apply within one year of each other, in which case hard proof of the date of invention must be supplied to settle the dispute.